Update your home with this modern American-made sofa. 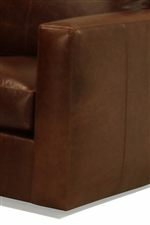 Plush cushions and wide track arms have a contemporary look, while offering comfortable seating. High quality materials and durable construction ensures that this sofa will be a long lasting favorite in your living room. The 1191 Two Seat Sofa by McCreary Modern at AHFA in the area. Product availability may vary. Contact us for the most current availability on this product.